"Can we develop a computer algorithm that assesses the creativity of a painting given its context within art history? 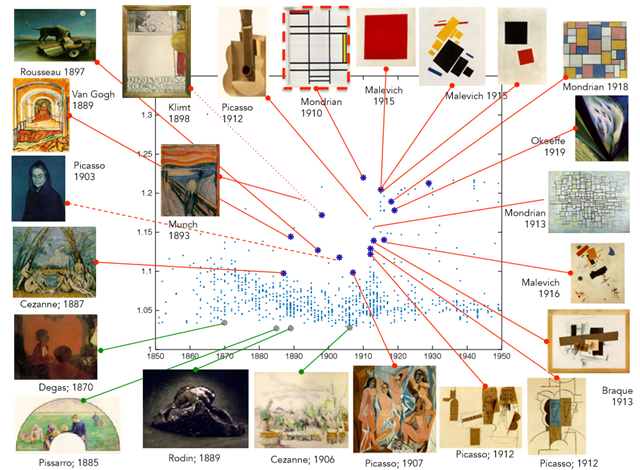 This paper proposes a novel computational framework for assessing the creativity of creative products, such as paintings, sculptures, poetry, etc. We use the most common definition of creativity, which emphasizes the originality of the product and its influential value." This problem space seems like a monumental challenge fraught with some really interesting assumptions and limitations. I just wanted to raise the questions that immediately came to mind when thinking about this challenge. Creativity itself is the most human part and seems to be the most difficult to define within an algorithm. Now my favorite artist is Claude Monet, why he is my preferred artist is based on my tastes and my personal experiences, I do not know enough about art to calculate how that relates to and builds upon artists who came before him. This idea of pushing forward your craft and assigning a value to the delta between the advancements must be really difficult. How do we measure this creativity? How do we weigh the influence of an artist on future work?. What do the experts say about creativity? Genius is the talent (natural endowment) that gives the rule to art. Since talent is an innate productive ability of the artist and as such belongs itself to nature, we could also put it this way: Genius is the innate mental predisposition (ingenium) through which nature gives the rule to art. What I think he is saying is that true genius can produce, recreate and reshape the rules by which we define beauty. Philosophically this is difficult for me to understand, but how do we express this in an algorithm? How do you define a sample? One of the admitted limitations of this entire paper is the sample paintings were limited to the public domain. This then excluded many of the most famous and influential paintings readily seen in museums and collections all around the world. Additionally it appears that most of the pieces that were included follow an almost exclusively European history, and so thus a very narrow cultural genealogy. I love this kind of research, it is just fascinating, and I looking forward to the engineers developing more practical applications for machine learning.